In this file photo taken on May 29, 2018, U.S. State Department spokesperson Heather Nauert speaks in Washington, DC. The U.S. government has declined to come to Canada’s defence in the growing diplomatic crisis over its criticism of Saudi Arabia’s human-rights' record. On Tuesday, a U.S. State Department spokeswoman, speaking at a media briefing in Washington, would not publicly condemn Riyadh’s arrest of civil-rights activists in the Mideast kingdom, as the Canadian government did last week. Heather Nauert said it is up to Canada and Saudi Arabia to resolve their differences. “We can’t do it for them,” she said. Reuters reported today that Saudi Arabia is stopping all medical treatment programs in Canada and is working on the transfer of all Saudi patients from hospitals there. The Saudi monarchy is angry over statements on Twitter last week from Foreign Affairs Minister Chrystia Freeland and her department that called for the immediate release of civil-rights activists, including women’s-rights advocate Samar Badawi. They also signalled concern over Riyadh’s new crackdown on dissidents. 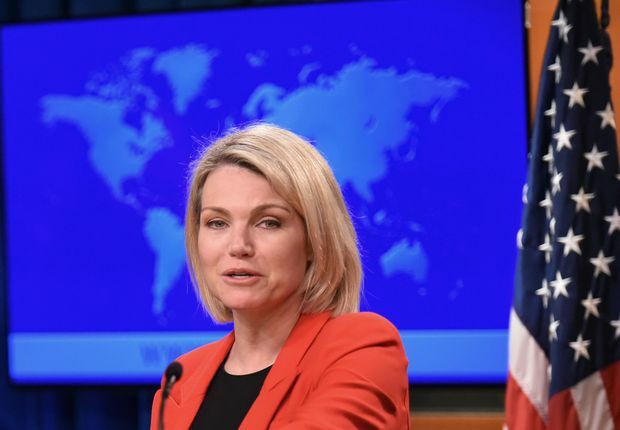 In Washington on Tuesday, Ms. Nauert balked when asked during a media briefing whether the U.S. government would publicly decry the recent arrest of activists in Saudi Arabia. “I am not going to get into this,” Ms. Nauert said. “Some of these issues we choose to discuss privately with our friends, our partners, our allies,” she added. Saudi Arabia has found support for its position among allies, including Jordan, which, in 2009, signed a free-trade deal with Canada and has accepted military training from Ottawa. The United Arab Emirates, Bahrain and Palestinian Authority also voiced support for Saudi Arabia, as did Comoros, Djibouti and Mauritania. Inquiries to the European Union’s Ottawa offices on Tuesday about whether the 28-member bloc would publicly condemn Saudi Arabia over the arrests – and support Canada in this dispute – were not immediately answered. Ms. Freeland has been unapologetic about the statements she and her department made on Twitter, one of which was also tweeted in Arabic by the Canadian embassy in Riyadh. Former Conservative foreign affairs minister John Baird said he thinks Canada shares blame for what has happened. He said the Trudeau government let the Saudi-Canada relationship wither in recent years because of public outcry over a $15-billion deal to sell Canadian armoured vehicles to Riyadh. Also, Tuesday, news broke that Saudi Arabia is halting purchases of wheat and barley from Canada. Cam Dahl with Cereals Canada, an industry association, said the Mideast country has given notice it will no longer buy from Canada. He said barley sales to Saudi Arabia make up a significant share of Canadian exports and this market will be difficult to replace because of agricultural protectionism around the world. According to Statistics Canada, Canada sold more than $44-million worth of barley to Saudi Arabia in 2017. There is anxiety in London, Ont., where General Dynamics Land Systems is building the combat vehicles for Saudi Arabia. Unifor Local 27 president Jim Reid, whose union represents hundreds of General Dynamics factory workers, noted the Saudis warned only “new business and investment” deals would be frozen, not existing transactions. But, he added, “Given the volatility of the actors over there, it’s anybody’s guess what happens." Thomas Juneau, an assistant professor at the University of Ottawa’s Graduate School of Public and International Affairs, said the Saudis appear to be going “full Qatar” on Canada, referring to the punishment Riyadh inflicted on its tiny Arab neighbour after a falling-out.